The company was listed as glove manufacturers in Addlewell Lane in Kelly's Directory of 1923, although it was not officially floated as a new company until 1925 (see below). 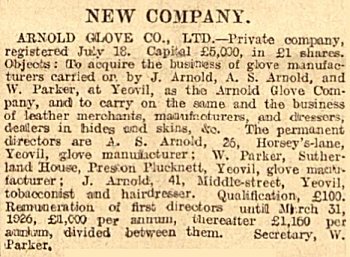 The directors of the company were glove manufacturers AS Arnold and William Parker (who was also the Company Secretary), together with tobacconist and hairdresser J Arnold. "My grandfather, Lyndall Parker, was the son of William and worked at the factory prior to WWII. During the war, he joined the RAF as part of Operation Starfish (a cunning plan to build decoy towns and set them alight to bamboozle the Luftwaffe into believing they had hit their targets) and the factory was used for the production of gloves for airmen and, I believe, some other parts of military uniforms. 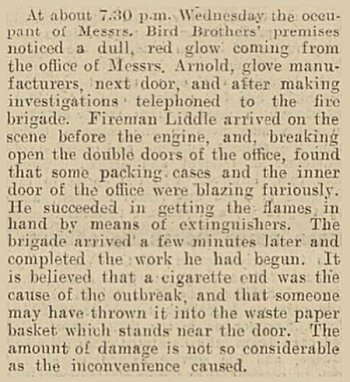 After the war, Lyndall rejoined the company but tastes and personal wealth had changed and luxury gloves were seen as too 'high end'. I think the company therefore fizzled out. Lyndall (and his wife Joy, a land girl he had met in Worcestershire) ran a Post Office for a time near Yeovil and then in 1953 moved to a smallholding near Bodmin in Cornwall." The company was listed in Kelly's Directory of 1935, Edwin Snell's Directory of 1954 and Foord's Directory of 1964. Nothing further is known at this time. If you have any further information, please contact me - see below. The announcement of the new company in the 22 July 1925 edition of the Western Morning News. From the 1 January 1932 edition of the Western Gazette. From the 1 March 1940 edition of the Western Gazette. This advertisement, typical of many placed in various editions of the Western Gazette by the company throughout the 1940s, demonstrates the shortage of labour for the gloving industryduring and after the war.